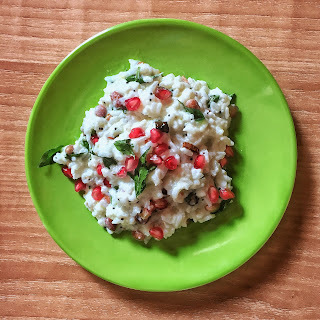 Mix curd, rice and salt. Heat a tadka pan. Add ghee. Add Peanuts. Make sure that the flame is low. Saute it for some time until it turns a bit dark in colour. Just a bit! Add Chana dal and urad dal. Saute them also for less than a min on low flame. Add mustard seeds, dried red chilli and ginger. Let them splutter. Turn off the stove and add curry leaves. Add this tadka to your curd rice. Mix it well. Add Pomegranate seeds too. If you want you can add finely chopped or grated carrots. You can also add finely chopped tomato. If you add some other vegetable then let me know in the comment section below.